The CHPC has an installation of Ansys-CFD along with a limited license for academic use only. The license covers use of the Fluent and CFX solvers, as well as the IcemCFD meshing code. Versions before 17.2 have been retired, but Versions 17.2, 18.0, 18.1, 18.2, 19.0, 19.1, 19.2 and 19.3 (aka 2019R1) are available. If you are a full time student or staff at an academic institution then you may request access to use Ansys-CFD on the CHPC cluster. Please go to the CHPC user database to register and request resources. Commercial use of Ansys software at the CHPC is also possible, but software license resources need to be negotiated directly with Ansys or their local agents. Remote license check-out has not been ruled out by Ansys, but once again this needs to be negotiated with the software vendor. Version 19.3 (or 2019R1 in AnsysSpeak) editions of the Ansys software are installed under '/apps/chpc/compmech/CFD/ansys_inc/v193' and Version 17.2 under '/apps/chpc/compmech/CFD/ansys_inc/v172', you get the idea. Please note that the license has been upgraded, making more resources available. We will monitor use and advise users accordingly. CHPC has academic licenses for AnsysCFD. There are 25 “solver” processes, available as aa_r_cfd and 2048 “HPC” licenses, available as aa_r_hpc. A license resource management system has been activated. If you request license resources (as in these example scripts), the scheduler will check for license availability before starting a job. License unavailability will result in the job being held back until the necessary licenses have become available. Although use of the license resource request is not mandatory, its use is strongly recommended. If you do not use the license resource requests, the job will fail if no licenses are available. A single aa_r_cfd license is required to start the solver, and includes up to 16 HPC licenses. Therefore you should request ($nproc-16) aa_r_hpc licenses. Each Ansys user shall submit only one PBS script (tying up one aa_r_cfd) at any given time. 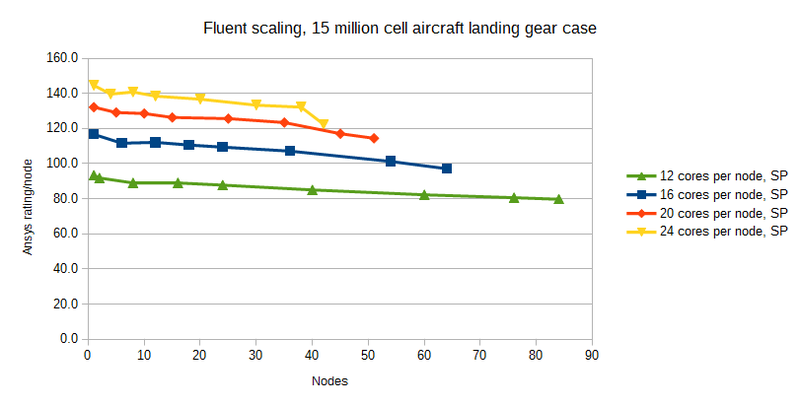 Given the constraint of the number of solver licenses, do your Fluent runs sequentially. Do not try to run more than one Fluent analysis at a time. 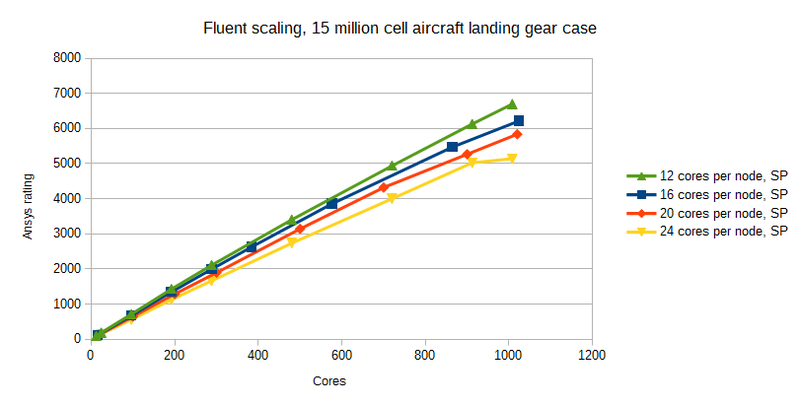 Take full advantage of the large number of cores available on Lengau to run each Fluent analysis faster. 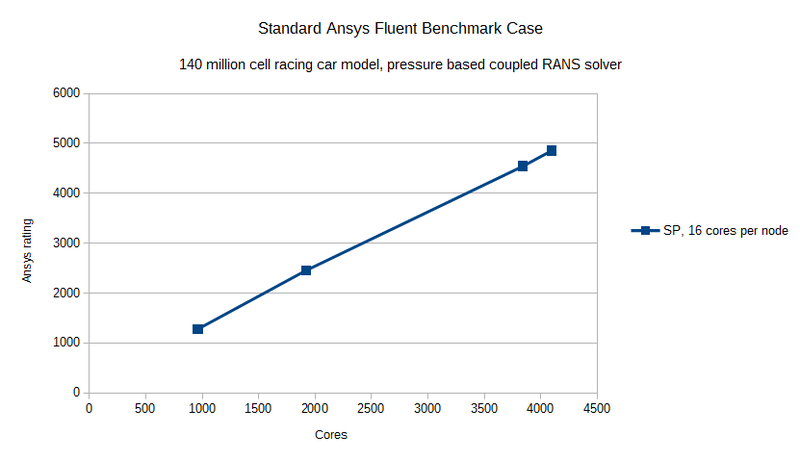 Without requesting special permission, you are entitled to use 240 cores for a Fluent run. Our testing has indicated very good parallel scaling down to 10000 grid cells per core (sometimes even less), which means that for any run over about 2 million cells, you should aim to use around 200 cores. If you need to submit a series of jobs, do so with a dependence on previously submitted jobs. The syntax is as follows: qsub -W depend=afterany:123456 thisjob.pbs, where 123456 should be replaced with the number of the previously submitted job, and thisjob.pbs is simply the name of the new script that you are submitting. The afterany directive will make sure that the dependent job gets launched regardless of whether the running job has finished normally, crashed or been killed. You can launch several fluent solver processes sequentially inside a single PBS script. Simply add in the necessary cd (change directory) and fluent 3d …. etc. lines. If the progress of your work is being limited by the number of licenses available at the CHPC, consider moving some of the runs to open source software. On the CHPC cluster all simulations are submitted as jobs to the PBS Pro job scheduler which will assign your job to the appropriate queue. ##### compute nodes have 128 GB each. ## and ties up more of your CPU-time allocation untill the job has finished. #### settings have been removed. # Edit this next line to select the appropriate version. V 19.2, 19.1, 19.0, 18.2, 18.1, 18.0, V 17.2, V 17.1, V 17.0 and 16.2 are available. It is not possible to simply record a journal file from the Fluent GUI, as these commands require the GUI to be open, and will not work with the “-g” command line option. It is not possible to generate images during the computation. Instead, these have to be created interactively afterwards. ##### a total of 216-way parallel. # Edit this next line to select the appropriate version. V 19.2, 19.1, 19.0, 18.2, 18.1, V 18.0, V 17.2, V 17.1, V 17.0 and 16.2 are available. Some tasks, such as setting up runs, meshing or post-processing may require a graphics-capable login. This is possible in a number of ways. Using a compute node for a task that requires graphics involves a little bit of trickery, but is really not that difficult. Thanks to the magic of software rendering, you have access to the GUI and graphics capability of the interface. This will create a file called server-info.txt, which contains the hostname of the master node, as well as a port number which the remote client will need to connect to. The Fluent Remote Visualization Client will start up. Provide the appropriate Server Info Filename and you will be able to connect to your Fluent process. Compress the case file, either with gzip or saving it as a .cas.gz file. There are two methods available for meshing on the CHPC system. Either work with IcemCFD or use the built-in T-Grid based meshing in Fluent itself. Neither ANSYS-Mesh nor Gambit is available on the CHPC system. If using the internal Fluent meshing, it will be necessary to transfer the surface grid and a file containing the necessary Fluent meshing and job set up instructions. If using IcemCFD, transfer the Icem .prj, .tin, .fbc and .blk (if using hexa) files, along with a recorded Icem script file for generating the mesh and exporting the file in Fluent format. Watch for absolute path names in the script file. Run IcemCFD with the -batch -script options to create the mesh. 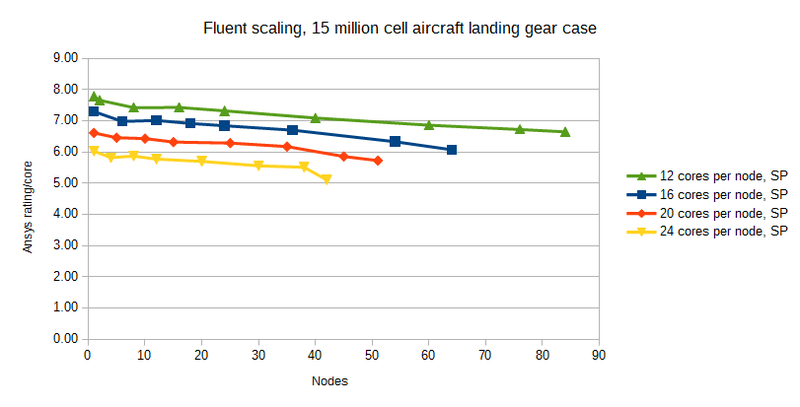 A more comprehensive Fluent script will be required to import the mesh and pre-process the case. Test locally! Give some thought to the resources being requested. Partitioning a simulation too finely will not necessarily speed it up as expected. 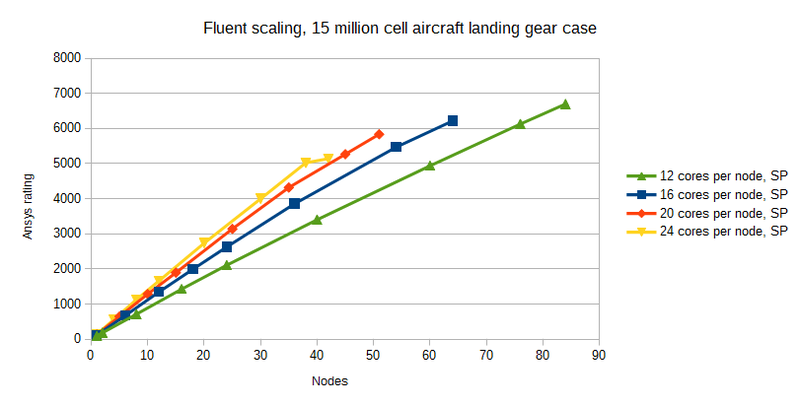 Although our tests indicate that Fluent scales well down to as low as 15 000 cells per core, please give some thought to license usage. The Fluent license on the cluster is a shared resource, and using too many of the available 1024 parallel processes may delay the launch of your job, or delay others. 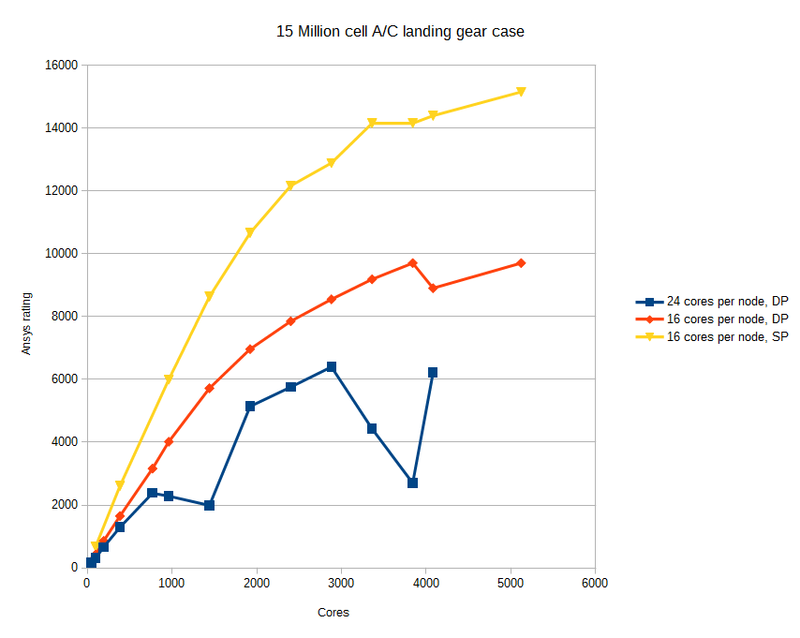 Refer to the graphs below to get a better quantitative indication of scaling. Commercial users should also take into account that best performance per node will be achieved by using the full 24 cores per node, but performance per core benefits substantially from using less than 24. Monitor files (such as cd or cl files) can be plotted with gnuplot even if no Fluent GUI is available. On a slow connection, consider using gnuplot with set term dumb to get funky 1970's style ASCII graphics.